With the amount of time you most likely spend researching, writing, and ruminating over your pitches before you send them, it’s important that you don’t end up making easily-avoidable mistakes that could instantly decrease your chances of that pitch being read, and turning into the publicity you crave. Good news! I’ve got a tiny trick – let’s call it what it is, it’s a strategy – that will help increase the chances of your pitch being seen, read, and answered. Yes, it’s beyond simple, but no, most small biz owners and entrepreneurs don’t do it before pressing send on their keyboards. That is why I’m telling you exactly how this trick/strategy works, today! Hopefully, this reminder will put you on the path of the PR Righteous, by helping you get email responses and boosting your chances of building media relationships. TWO PR WINS FOR THE PRICE OF ONE! Check the personal social media feed (Instagram or Twitter) of the media person you’re pitching because it is PACKED with PR intel that you may not realize is right at your fingertips! First things first, what social media feeds should you be checking? Before pressing send I want you to give a quick glance over at your media target’s personal feed (not just the media outlet’s main feed). This could mean their Twitter feed, though lately, I find much more luck with this tactic on Instagram and InstaStory – they truly give me the most real-time insight. Before we even get the juicy PR intel that a social media feed can provide, let’s start with the most basic: Does their social media handle’s profile confirm that they still work at the media outlet you’re pitching? Sounds silly, but media jobs are very dynamic these days and you can save yourself time (and a little embarrassment) by confirming they do indeed still work where you think they do. Look at what they’re up to: Are they on vacation? If they are, and you’re emailing them, your email has likely been added to a pile of other emails, and you’ll be wondering why they aren’t responding, while they’re not even at their desk to see your pitch. If this was a timely or urgent matter, you will be waiting for their response while missing out on the chance to pitch OTHER members of the press (or their outlet) who could use your story! Discover personal connections: Perhaps through their feed, you discover that you both went to the same college, you both love Goldendoodles, or are both fans of vegan mac & cheese – you name it! These discoveries not only make you feel better because they humanize your press targets (The press, they’re just like us!) which will relax you as you reach out, but they also provide you with opportunities to A) Comment and connect on their feed about those moments and B) Mention them when you reach out.Before you ask, “Will this make me look like a weird stalker?”, let me assure you no, it won’t. You aren’t breaking into a private account. You’re showing that you are engaged and following them and making the effort to get to know them, and THAT can sometimes make all the difference! There you have it friends – a four-step strategy that will take you minimal time, and will probably shave off the time you spend on public relations work in the long run. 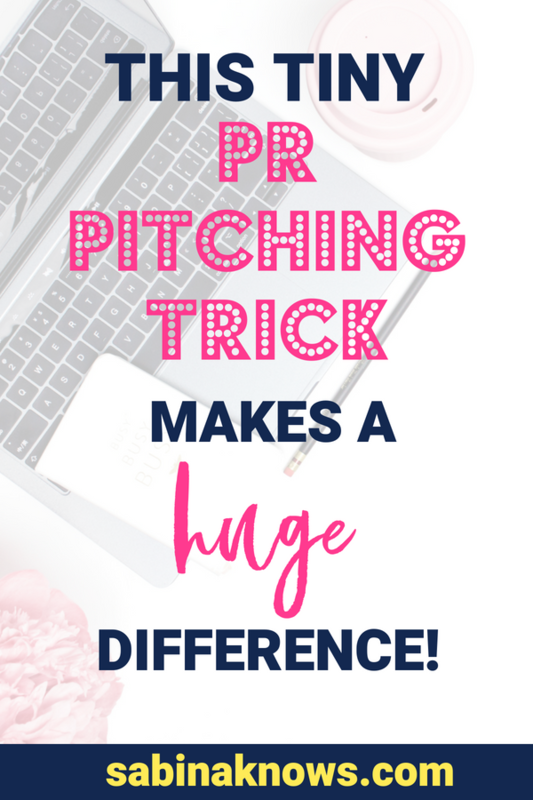 I urge you not to skip this step when trying to whiz through your pitching tasks, because as I say you to you on a near-weekly basis: PR success is 100% tied to building relationships with the press, and this is a part of that process, not to mention a part of simply being professional, polite and strategic! Are you already checking social media feeds before you pitch? Do you have any other must-dos before pressing send on outreach emails? I’d love to hear! Share your methods in the comments below!